Born from a fortuitous encounter between three outstanding musicians with a distinguished career in the field of progressive music, Invisible Rays seems to embody the very definition of “one-off”. 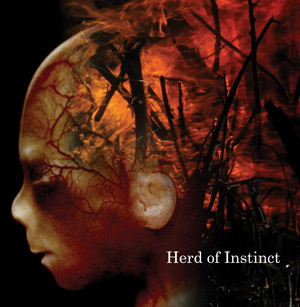 The album is the result of an impromptu jam that took place in March 2011, when Warr guitarist Trey Gunn (known for his tenure with King Crimson in the late Nineties), San Francisco guitarist Henry Kaiser (one of the pioneers of American free improvisation) and Swedish drummer Morgan Ågren (of Zappa, Kaipa and Mats/Morgan fame) found themselves with some time on their hands before a presentation at a music conference in Sweden. When they first heard the rough mixes, the sheer quality of the recordings took them by surprise, in spite of the almost completely unstructured nature of the material. 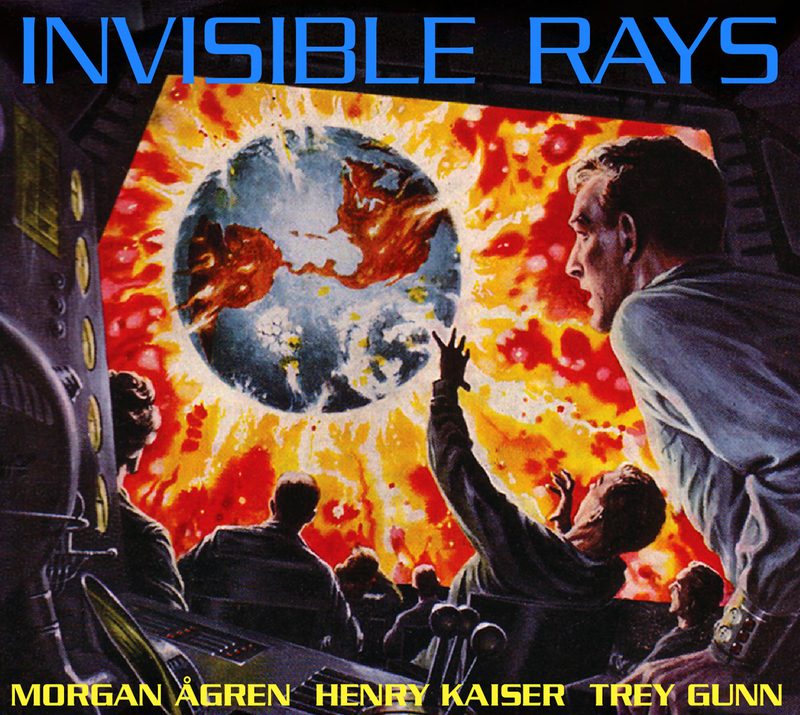 The above description makes it clear that Invisible Rays is the product of a spur-of-the-moment situation, prompted by a unique set of circumstances that allowed the three artists to make music together for the first time. While the bulk of the tracks do have a semblance of compositional structure, the two pieces that bookend the album are intentionally loose and sprawling, brimming with the simple joy of playing without a recognizable script. The title-track, strategically positioned at the opening of the album, acts as a sort of gatekeeper, its intensely powerful 22 minutes occasionally bordering on white noise. Kaiser’s guitar tone can turn almost unbearably sharp, aided and abetted by Ågren’s explosive drumming, while the eerie wail of Gunn’s Warr guitar supplies a gentler undercurrent. While certainly not cohesive, and the kind of stuff that is more than likely to scare the more conservative prog set away, the track often hints at King Crimson’s live improvisations, though in some ways brasher and bolder. Interestingly, though the three artists produce an impressive volume of sound, there is also a minimalistic aspect to the music, due to the limited number of instruments involved. Rhythm is very much at the heart of Invisible Rays, with Ågren’s supercharged drumming all over the place, setting the pace for Kaiser’s wild guitar exertions and Gunn’s more sedate, atmospheric contribution. Tantalizing ethnic suggestions – one of the constant features of Gunn’s extensive output – emerge in “The Magic Ring of Invisibility”, which acts as a foil to the unbridled improvisation of the title-track, and at the opening of “The Last Guru”, before things turn more dissonant, with an almost metal-like sense of aggression. Only “Ghost Red Wires” maintains a hauntingly mellow mien throughout its 4 minutes, the guitar sound flowing smoothly in contrast with its imperious presence in most of the other tracks; while in “Where Is Juan?”, Gunn and Ågren indulge in some funky sparring. In closer “An Unusually Nice Hotel”, the slow, solemn pace of the drums – which provides a steady, nearly unchanging backdrop throughout the whole 12 minutes of the track – and the mournful tone of the Warr guitar are offset by the gradual progress of Kaiser’s piercing, abrasive guitar. Clocking in at a hefty 71 minutes, Invisible Rays – which comes packaged in a striking cover out of a Fifties science fiction B-movie – is definitely not for the faint-hearted. Even staunch King Crimson fans might find the album a somewhat daunting proposition, while lovers of free improvisation are bound to appreciate it much more than those who prize melodic content or compositional cohesion. A worthwhile testimony of a unique opportunity, it may, however, ultimately prove less than satisfying because of its basically raw (though powerful) nature. 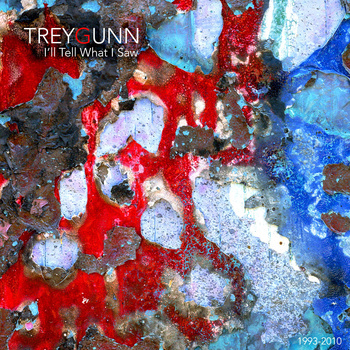 Therefore, the album is probably not the best bet for those who would like to get acquainted with Trey Gunn’s outstanding contribution to the cause of progressive music.